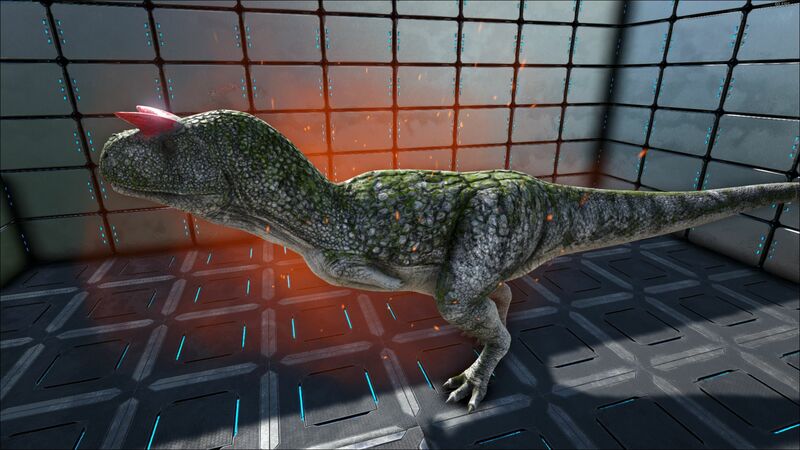 The Alpha Carnotaurus is one of the Alpha Predators in ARK: Survival Evolved. The Alpha Carnotaurus is a bigger, stronger version of the Carnotaurus. In addition to their own strength, they also buff the damage and resistance of any nearby wild carnivores. They pose a significant threat to any players who aren't fully prepared to encounter one. Alpha Predators cannot be knocked out. Defeating an Alpha Carnotaurus grants a large amount of XP and gives all nearby players a Rex Bone Helmet. They also frequently drop recipes, high-quality weapons and armor, and various other items. Alpha Carnos do not drop normal raw meat when harvested. Instead, they give very large quantities of Raw Prime Meat. Alpha Carnotaurus are extremely aggressive and attack players and dinos on sight. Their headbutt attack has a high knockback and can potentially push players and dinos off cliffs. Relative size in comparison to a regular Carnotaurus and a Rex. 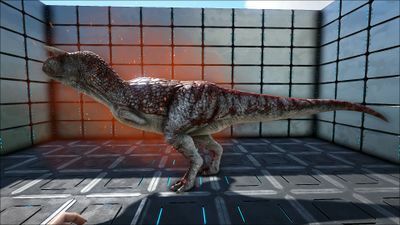 The Alpha Carno is about 1.5x the size of a normal Carno and share the same color palette, but with a slightly darker shade. They also have a glowing red aura surrounding them, making them easier to differentiate from the normal counterparts. This section displays the Alpha Carnotaurus's natural colors and regions. 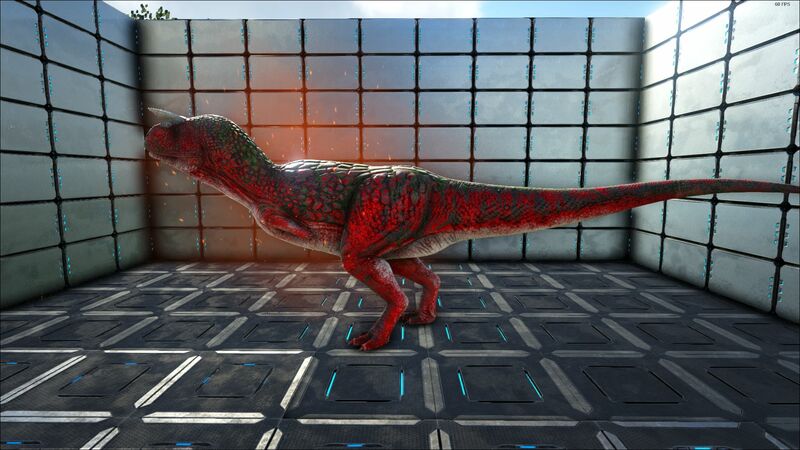 For demonstration, the regions below are colored red over an albino Alpha Carnotaurus. 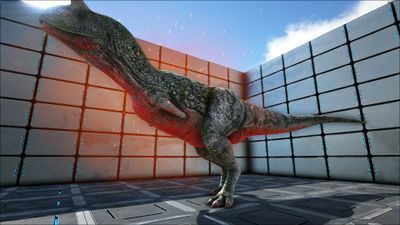 The colored squares shown underneath each region's description are the colors that the Alpha Carnotaurus will randomly spawn with to provide an overall range of its natural color scheme. Hover your cursor over a color to display its name and ID. 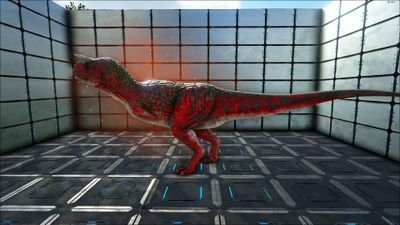 For example, "cheat SetTargetDinoColor 0 6" would color the Alpha Carnotaurus's "body" magenta. 5The Alpha Carnotaurus is incapable of drowning. The Alpha Carno bites the target. The Alpha Carno headbutts the target causing considerable knock-back. This section describes how to fight against the Alpha Carno. Avoid the extreme damage by waging a ranged battle. If that is not an option, guerrilla tactics with a speedy mount is acceptable. A high health, stamina, and damage Rex or Spinosaur can usually fight a similarly leveled or lower level Alpha Carnotaurus one-on-one and win if it's mounted; but bringing another dinosaur, especially one that can Mate Boost to the mounted combatant is definitely a good idea. A tamed Giganotosaurus can almost always defeat an Alpha Carnotaurus, but be mindful of the rage meter when battling. In all cases, try to clear any surrounding normal Carnotaurus so they cannot assist the Alpha Carnotaurus in battle. You can also solo the Alpha Carnotaurus with a Baryonyx in the water if you stun it and beat it down. Be mindful of when the stun ends however as when it ends you can find yourself with a Carnotaurus that can deal critical damage to you in several seconds. Ranged weapons work best, as once the Alpha Carnotaurus can harm the player, it is normally already over in the Alpha Carnotaurus' favor. Powerful mounts can turn the battle against it. Swarming it with animals might help as the player can either flee or attack. The damage, health, and speed all combine to make the Alpha Carnotaurus a notorious killer of small establishments and massive regimes alike. Don't let it get near your livestock! A determined Alpha Carnotaurus can even chew through stone walls eventually, so keep your animals away from any fencing to stop it from refreshing its aggression to get to them. Try to stand on a very steep hill. Then simply get a ranged weapon, stand far back, and fire away! Alpha Carnotaurus are very slow swimmers so taking the battle to the water may be advisable, especially if powerful water mounts like a Mosasaurus can be used. The Alpha Carnotaurus cannot dive so stabbing it from below can work. If the Alpha Carnotaurus gets stuck on some rocks, animals with a much longer reach than it like a Spinosaur or a Brontosaurus can use that reach to carve up the Alpha Carnotaurus' health without getting hit back. The Baryonyx is capable of stunning the Alpha Carnotaurus in the water and can usually very easily kill one on its own. The damage and resistance buff that it gives to nearby carnivores can be seen as an arrow pointing up, with a "+" sign inside of the arrow. Rarely, Alpha Carnos can spawn with Yutyrannus and the usual Carnotaurus. Tamed Yutyrannus cannot control it as a minion. Its size is comparable to that of an Allosaurus. This page was last edited on 14 April 2019, at 16:18.